In 'The Greatest Showman', we are transported into the world of the circus, as we follow the life of P.T. 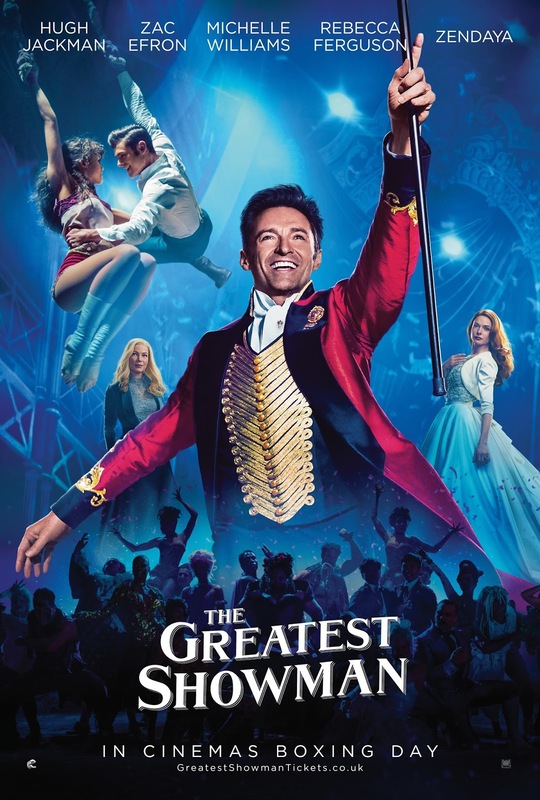 Barnum (Hugh Jackman), as he rises from lowly origins to bring together people with unique talents, or otherwise shunned by society, to create the circus. A musical biopic, based on real people and events, with some creative license taken of course, spun into an uplifting tale of celebrating what makes you unique. That's the key selling point and theme of this movie, that we should all come together, despite our differences, and celebrate what makes us unique. Even though this story is set around 150 years ago, this message still holds true today, as prejudices still exist worldwide. The cast of Barnum's circus include General Tom Thumb (Sam Humphrey), a man with dwarfism, and The Bearded Lady (Keala Settle), as well as many others who look different somehow, including albinism, covered in tattoos, exceptional height, or the 'Dog Boy', who is covered in hair. The film portrays Barnum as someone who celebrates these unusual attributes, and wants them to be seen rather than hidden away. There is also a nice exploration of the racial tensions of the time, through the love story between playwright and Barnum's protégé Phillip Carlyle (Zac Efron) and trapeze artist Anne Wheeler (Zendaya), a much anticipated element of the film if the trailers are anything to go by. Their story is only a small part of the entire film, but the outright disgust shown towards them by others is definitely historically accurate, and certainly food for thought. Even Barnum himself is somewhat of an outsider, a man from lowly birth who has to work hard to make his fortune and provide a good life for his family, especially when his wife, Charity (Michelle Williams), gives up the wealth of her parents' home to be with him. He is an underdog, striving for success; success which quickly goes to his head when he finds it, causing him to forget about why he brought his performers together in the first place, to forget about treating them as friends and equals. This is another important theme explored in the film, the price of fame and success, and what truly matters in life the most. The film portrays Barnum's story as an uplifting one, but it's hard to forget about the realities of circuses while watching, which can make this somewhat problematic. The truth is, many of Barnum's acts were scams and cons, artificially created or exaggerated for shock and entertainment value, and he exploited marginalised people in order to make profits for himself. And while the lions and elephants in the film are CGI, we cannot forget that real animals were kept in terrible conditions in travelling circuses, and treated cruelly in order to make them perform. The film does touch on these elements a bit, especially through the critic James Gordon Bennett (Paul Sparks), who criticises the circus as being one big scam, with Barnum countering that people are willing to pay to be hoodwinked. There is a dark history to Barnum and the circus, one which should not be overlooked, but 'The Greatest Showman' instead chooses to make this a story of triumph for the marginalised, which is definitely a more uplifting message, but personally, I couldn't completely forget about the historical accuracy while watching. However, if fantasy and escapism is what you're after, then the film does a great job of that. I especially loved watching Barnum's children reacting to his show, with the simple joy and wonder that only children possess. And it's true that sometimes we want our entertainment to be escapism, to make us believe in magic and dreams and wonderland, instead of only dwelling on accuracies or hard hitting social commentary - a fact that is true for both the circus spectators in the film, and for those watching the film itself. The costumes and effects are a large part of this, as everything takes on a sparkly, glossy sheen to encapsulate the magic and the fantastic. And of course, the music is a huge part of the film. Musicals are hit or miss for me, but I really enjoyed the soundtrack to this one; 'This Is Me' has quickly become the anthem of the movie, and for good reason, as Keala Settle belts out this uplifting, triumphant number, but the rest of the soundtrack is just as enjoyable, especially 'A Million Dreams', 'Rewrite the Stars', and 'The Greatest Show'. The closing scene in particular is a breathtaking medley of music, dance, acrobatics, artistry, costumes, effects, and wonder, summing up the fantasy that we are allowed to experience for a few hours, and forget the real world. Is it a perfect movie? No, but then what is? There is a problematic history behind Barnum's story, though this film may make more people aware of it if they choose to go do the research after watching it. The glossing over of this dark past can be a bit troubling while watching, but as an uplifting, inspiring story, it does a fantastic job of that. Despite my reservations, I did enjoy the film overall, especially the big musical numbers, the Phillip and Anne love story, and the spirit of family, friendship, acceptance, and celebration that prevails in the end. It may be set in the past, but these lessons are still important for people all over the world to remember today.